We are happy to welcome well behaved family dogs and we also offer a non-dog camping area. 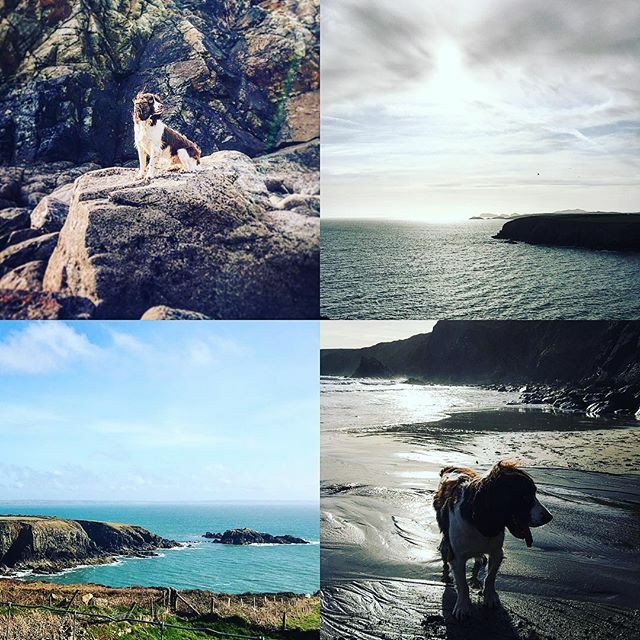 Many of our local beaches are open to dogs and the Pembrokeshire coastal path is perfect for longer walks against a beautiful backdrop. Please note dogs are not permitted in the non-dog camping area (part of field 3) – please see site map for further details. For the enjoyment of all our guests, and the safety of your pet, dogs must be kept on a lead at all times whilst on the park and owners must be vigilant at clearing up after their dogs. Dogs are welcome on Caerfai beach all year round. No dogs are allowed on Whitesands beach from 1st May to 30th September and dogs are not permitted on parts of Newgale Beach during these dates. For a list of local dog friendly beaches, gardens & attractions in Pembrokeshire, VisitPembrokeshire has a guide for dog owners. Please note dogs are not permitted in the non dog camping area – this is clearly signposted on the site. Caerfai Bay Caravan & Tent Park has a small exercise paddock for you to exercise your dog, which is signposted next to the entrance/exit of the Park. A dog bin is situated here. Waste can also be deposited in the skips. Terms and conditions relating to pets on the park. The Management reserves the right to refuse admission to, or eject from the Park, any dog which it considers inappropriate as a family pet or/and any owner not abiding to the rules as detailed below and terms and conditions of booking. No dangerous dog breeds permitted – Pit Bull Terrier, Japanese Tosa, Dogo Argentino & Fila Braziliero. Limited to two dogs per booking, with discretion for an extra dog during the low season. Dogs must be kept on leads (not exceeding 2 metres) at all times on the Park. Please exercise dogs off the Park. No dog fouling in the camping and caravan fields. Should accidents happen, please clear up after your dog and dispose of it in the bins provided (not hedges). There is a dog bin in the dog walk area and there are refuse bins in the outside refuse areas. Dogs are not permitted in the non-dog camping area. Please DO NOT leave dogs unattended at any time. Dogs, excluding guide dogs and hearing dogs, are not permitted in the amenity blocks- these include the Reception, laundrette, dish-wash areas, information room, and toilet/shower blocks. Any decision about pets on the site will be taken at the discretion of the management. Please note dogs must not be left unattended at any time in any accommodation or vehicle. Dogs are welcome in our Pet Friendly Caravans though we do ask that they are kept off the seats and not permitted in the bedrooms in the Holiday Homes. Please remember your dog’s bowl and bedding. Maximum of one dog allowed.